turboDial creates Call Note Record for completed calls – that is, calls that are answered by a human or a machine. It does not create a Call Note Record for an unanswered call attempt, that is, a call that is initiated, starts ringing, but then is stopped (hung up) before a person or machine answers it. Therefore, the normal methods for creating Reports cannot capture these unanswered calls. Note that it is not common for calls to be unanswered, and claims of unanswered calls may be an indication that your calling agents are not fulfilling their assignments. Most people have some kind of answering machine or voice mail and as a result calls will almost always be answered. Your team may see more than the normal number of unanswered calls if the demographic characteristics of your prospect list include people who use land-line phones and may or may not have answering machines. When these types of land-line phones are busy or if there is no one available to answer and no answering machine attached, then a call will be unanswered. You can have a Note Record created after a call attempt by saving a Call Outcome in turboDial. 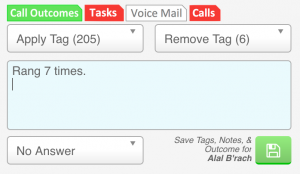 You can then create a Report that summarizes those specific Note Records to track your call attempts. Create a Call Outcome called “No Answer”, and train your calling agents to save this Call Outcome after any call attempt they initiate that is not answered. You will be able to create saved reports that look for the No Answer value in the Call Outcome field. You may also want to instruct your agents to leave a manual note at the same time they save the Call Outcome, and in that note they can state how many times they allowed the phone to ring, or if the line was busy, etc. Check a random set of the unanswered calls against the call log data in Twilio. You can find the Log data at this page in Twilio. Once on that page choose the “Connect App: turboDial for Infusionsoft” in the upper right corner. On that page you can search by “To” number and “No Answer” status and then open the call details to see how many seconds the call was allowed to ring. You can have Note Records created for all call attempts using the automation triggers described here. On that page please see the section titled “Call Attempt Reporting”.